In an effort to stimulate economic growth and development of local businesses and keep local resources in the community this Local Preference Policy (LPP) is established to encourage local businesses to participate in the competitive process of supplying goods and services to the Authority. Q: Why has JAA instituted this policy? A: The Jacksonville Aviation Authority is an important asset of the region and a key economic engine. As part of our mission, we think it is our role to help local residents and businesses as much as possible, especially during these difficult economic times. 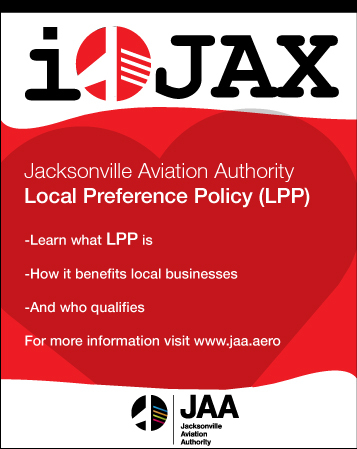 A local preference policy is something that JAA Executive Director and CEO Steve Grossman wanted to explore and implement since shortly after arriving in Jacksonville in 2009. Q: What businesses qualify as local? A: Any business that is located in the seven-county region (Duval, Clay, St. Johns, Nassau, Flagler, Putnam and Baker) and has had an office of three or more people for at least one year prior to the release of a JAA solicitation for bids. Q: What actual preference does a local business get? A: For projects that are awarded by a bid process, local firms would receive 5 percent preference. For example, if a non-local firm bid a cost of $96,000 on a project and a qualified local firm bid $100,000, the local firm would win the business after its bid, after factoring in the 5 percent preference, was converted to $95,000. The local firm would still be paid its $100,000 bid. Q: How about request for proposals from professional firms such as engineers, architects and financial service providers where the bidders are judged based a range of criteria such as experience, qualified professionals and understanding of the project goals? How will the JAA policy work? A: For projects selected by the RFP process that use 100 point criteria, qualified local firms will receive an additional 5 points. Additionally, non-local companies that use a local firm as a sub-contractor can receive up to 5 points. Q: What do you say to those who might criticize this policy because it’s seen as anti-competitive and forces the JAA to pay artificially higher costs for goods and services? A: We believe the benefits to our community outweigh any potential additional costs. Again, our intent is to produce a positive economic impact on our region. We are committed to a long-term strategy of providing jobs and economic benefit locally, and this policy helps us achieve that. Q: Are all JAA projects subject to local preference? A: No. Projects that receive any federal or state funding are not included because federal and state law prohibits it. Q: How will you determine whether a company does in fact qualify for local preference? Do you have procedures for checking? A: Yes. JAA will utilize the Local Business Verification Form to ensure that companies we do business with are qualified vendors. 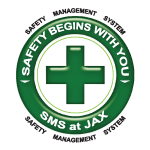 For further information contact JAA Procurement Department at 904-741-3667.